There is a place in the province of Reggio Calabria, where grows “Annona“, the exotic fruit you never imagined to see enriching the seafront of “Falcomatà”, in the very heart of Reggio, a seafront also known as “the most beautiful kilometer in Italy” (as described by Gabriele D’Annunzio). Along this splendid walk, you watch to probably the most fascinating place of the city of Reggio. 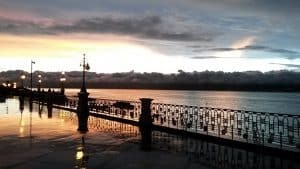 Overlooking the sea, you can distinguish a multitude of palm trees and exotic plant species, while along the avenue you can admire fantastic buildings in Art Nouveau style, such as Palazzo Zani, Palazzo Spinelli and Villa Genovese Zerbi. Here you can find the sweetest fruit of South American origin, which grows not only on the beautiful seafront of Falcomatà, but also throughout the all province of Reggio Calabria, offering itself as an excellent ingredient for tasty desserts. Annona is cultivated only in the areas of Reggio Calabria and throughout the coastal area that runs from Bagnara to Gioiosa Ionica and in Sicily, in the areas of Messina, Roccalumera. In any case the specimens produced in the city of Reggio Calabria got a special protection, a Municipal Name of Origin, like “Annona di Reggio“. Native to South American countries such as Peru and Ecuador, Annona Cherimola has found in the province of Reggio Calabria the ideal conditions to grow and develop characteristics of excellence. 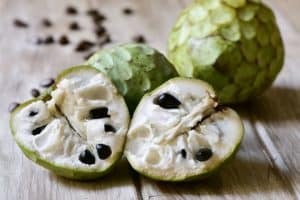 Annona in this area of ​​Calabria is now present for more than two centuries, since the Spaniards introduced it on the land, and can, therefore, be considered in all respects a true goodness of tradition local. Especially since the varieties grown in the area, they have derived some purely local variations whose development has been favored by both spontaneous selection and the intervention of farmers. The Annona provides a wide range of varieties; the most common is the “Annona Cherimola“. The plants, whose stem exceeds 2 meters in height, flourishes between the month of May and that of August, lasting, sometimes, until October. The harvest, however, begins after about five to eight months after flowering and takes place before the fruit reaches full development. 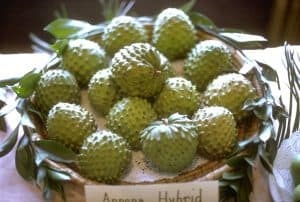 The Annona of the Spanish variety are green in color and conical in shape, sometimes similar to a heart, with very thin skin and homogeneous and moderately depressed areoles. Local varieties, instead, are of irregular shape and often deformed, have a smoother skin of green-yellow color with possible brown spots and veins. 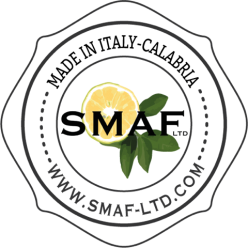 The average weight of a fruit is just over 200 grams; it is characterized by an incredibly sweet and aromatic flavor that resembles that of banana, pineapple, strawberry and other tropical fruits. 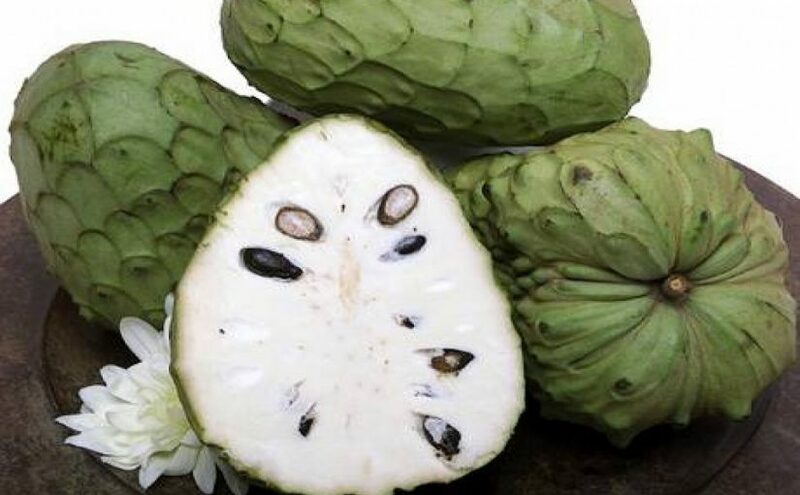 What makes Annona particularly appreciated is not only the very sweet and pleasant taste, but also the remarkable nutritional properties of its pulp, rich in sugars, proteins, vitamin C, calcium and potassium. The fruit is also practically fat-free and not excessively caloric. It suffice to say that 100 grams of Annona contain 68 Kcal, compared to 15.8 grams of carbohydrates, 0.2 fat, 2.2 fiber and 1.8 protein. 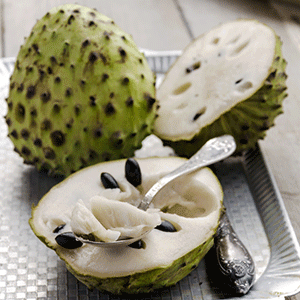 Further, Annona is very rich in B vitamins, with traces of folic acid, riboflavin, pyridoxine and niacin. In order to conserve Annona, local population of Reggio transforms it into various traditional confectionery products such as ice cream, sorbet, jam and delicious desserts. If you hear of a delicious white, red or “Rosè” wine, coming from the town of Bivongi, you are talking about a rare Bivongi “Bianco” (an Italian word meaning “white wine”), an authentic Mediterranean and Calabrian wine rated DOC (a so called protected denomination, acronym of “Denominazione di Origine Controllata”). The white version of this wine is relatively rare. The red and rosè wines represent the majority of production (Bivongi “Rosso” is two years old before commercial release, of course after six months in barrel). The latter are made from grapes of Gaglioppo, Greco Nero, Nocera and Calabrese (Nero d’Avola). The white comes from Greco Bianco, Malvasia Bianca and Ansonica grapes. The Bivongi wine is Sparkling when white, intense when red or rosè, and it is rated DOC since 1996. Bivongi DOC was formed in that year (1996) to represent the small amount of hectares planted way down on the east coast of Calabria’s toe shaped peninsula, while the more famous Ciro is on the north of the same coast and the Greco di Bianco DOC is just on the south. Taste: dry, harmonic, fruity. It should be served at 45º – 49º Fahrenheit, 8º – 10º Celsius (perfect for Seafood in general). 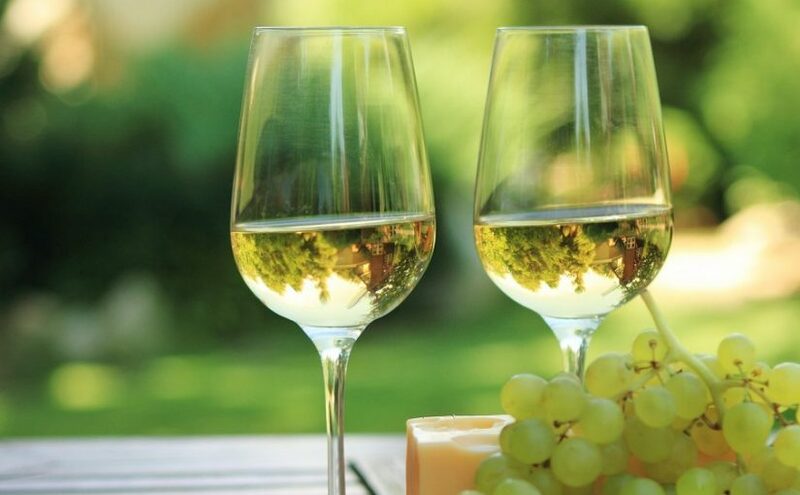 According the official regulations, Bivongi white wine can be produced with varying blends of Greco, Montonico Bianco, Ansonica and Malvasia. Red wine is made with Gaglioppo and / or Greco Nero, while some Castiglione, Nero d’Avola and Nocera are also permitted. 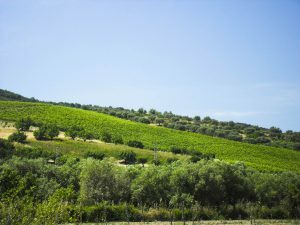 The white wine, the red and rosè versions are all produced inside the small cluster of hills on south of Catanzaro. Further Bivongi DOC wine is produced in an area that includes 11 municipalities between the province of Reggio Calabria and the one of Catanzaro. The area has a high potential in wine production since the ancient Magna Graecia, creating a great impact on the local economy. Precisely, the production zone of Bivongi DOC includes the villages of Bivongi, Camini, Caulonia, Monasterace, Pazzano, Placanica, Riace, Stignano and Stilo in the Province of Reggio Calabria, and the village of Guardavalle in Province of Catanzaro. No surprise that Bivongi wine has remained relatively unknown in the wine world outside Italy, given that introduction of the DOC title is only 1996. Further, another reason for being ignored is that the wine is made from vineyards in the municipalities of Bivongi, Caulonia, Monasterace, Riace and Stilo, and all of these are cut off, inside the Reggio Calabria province, from the main national wine trade; explaining why the wine is normally for local use. Now, the area, where geographically the vineyards, are planted is the zone forming the ball of Italy’s ‘foot’, an area signed by coastal hills, the “Serre” mountain chain and the rivers, which flow towards the Ionian Sea. Therefore, due to the mountains nearby, the vineyards of Bivongi wines are located on the eastern side of the hills (in an area with a more temperate climate), mostly among the lower slopes and within a few miles of the sea. The proximity of the Mediterranean Sea is important to the terroir, but, at the same time, the producers are far from main communication routes. Therefore, this delicious and authentic Mediterranean wine is a real hidden treasure. The mesoclimate of the area helps the high quality of the grapes. Namely, the sea helps to moderate the intense heat of the south Italian summer, and the alternation of cooling and heating generates during the day morning and afternoon breezes, which minimize the risk of fungal vine diseases. The special mesoclimatic area is large and covers Guardavalle, a municipality in the colder north of Catanzaro province. The climatic conditions at Bivongi are magnificent, while inside the DOC Zone the other nine municipalities in the provinces of Reggio Calabria and Catanzaro, have refined, according to temperatures a little bit colder, the winemaking on the basis of traditional methods, obtaining a Bivongi wine based also on local grape varieties (such as the white Greco Bianco, Guardavalle and Montonico, and the red Gaglioppo, Greco Nero and Calabrese). Bivongi is a charming little town in the north of the province of Reggio Calabria, only 8 miles from the Ionian Sea. In the past, Bivongi was better known for the woodcarving skills of its inhabitants, for its iron, silver and molybdenum mines, and for its thermal baths. Afterwards, its fame increased due to its mulberry trees, the production of wool, and its silkworm farms (called “vomvix” in Greek and believed to be at the origin of Bivongi’s name). 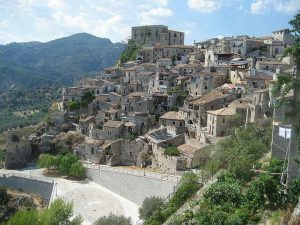 After this fascinating past, the village is nowadays situated on the slopes of Mount Consolino, where Bivongi dominates a valley rich with vineyards and olive groves, and crossed by the River Stilaro.